Syracuse was coming off of one of the most successful campaigns in school history, with their first NCAA bid in a decade. 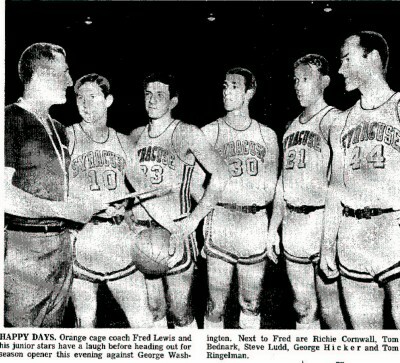 The team was losing seven seniors, including the incomparable Dave Bing, plus big man Val Reid was ineligible to play. Sharpshooter George Hicker was in a terrible automobile accident the previous spring, and it was questionable if he could return. The team had some returning talent, but was lacking in depth and height. The prediction for the season was low. Rick Dean, at 6'6 " would be the team's tallest player, and was the returning starting center. Vaughn Harper would continue to dominate the boards. Hicker surprised everyone by being able to return, and he and Richie Cornwall formed a nice outside shooting tandem. Steve Ludd would provide steady ball handling. Fred Lewis knew his team was going to have problems out rebounding the opposition, so he played to their strength which was team speed. The Orangemen played an aggressive pressing defense and ran the fast break as much as possible (similar to the previous year's squad). The Orangemen surprised everyone. Benefiting in part from a schedule weaker than normal, but also from outstanding hustle and team chemistry, the team got out to a 19-2 start, which included a twelve game winning streak. The team had this success despite missing Dean for three games with a knee injury he sustained against LaSalle, and having virtually no team depth. Tom Ringelmann and Bob Kouwe were the main reserves (Kouwe missed the early season due to his own knee injury). Frank Hamblen and Dave Aldrich were the remaining reserves with any real playing time. Hicker and Dean both had some big games, each twice scoring 30+ points in a game. Overall, the team had very balanced scoring from four of the five scorers. Uncharacteristic of many Lewis teams, the same five started all but four games (and those four were related to Dean's injury). The team reached #8 in the AP polls. Then as the season was wrapping up, then went into a tailspin, losing three of their last four regular season games as the team struggled to score. They nevertheless were offered a post season bid to the NIT tournament, where they would meet highly rated New Mexico. The Lobos of New Mexico were a strong rebounding team, and were known for slowing the game down and executing well in the half court set; exactly the opposite style of play of Syracuse. The Orangemen fell behind early in the game to the Lobos; they fought hard and got within two points, but ended up losing 66-64. However, it was by all accounts a very successfully season for the team. The next season looked to be even brighter with the only loss being the talented Rick Dean, and the addition of freshman superstar Ernie Austin and big man Wayne Ward.